Soak up the sights of Australia's most scenic drive on a Great Ocean Road day trip from Melbourne. Follow the winding coastal road from Torquay to Port Campbell, stopping off for lunch in Apollo Bay. Bring your camera to photograph the wild coastal scenery and pristine beaches bordering the Great Ocean Road, and see the rugged splendour of the Twelve Apostles. Hear the tragic story of Loch Ard Gorge and other poignant sites on the Shipwreck Coast, and listen to the insightful commentary provided by your experienced driver guide on this relaxing Great Ocean Road day trip by comfortable air-conditioned coach. Soak up the sights of Australia's most scenic drive on a Great Ocean Road day trip from Melbourne. Follow the winding coastal road from Torquay to Port Campbell, stopping off for lunch in Apollo Bay. Bring your camera to photograph the wild coastal scenery and pristine beaches bordering the Great Ocean Road, and see the rugged splendour of the Twelve Apostles. Hear the tragic story of Loch Ard Gorge and other poignant sites on the Shipwreck Coast, and listen to the insightful commentary provided by your experienced driver guide on this relaxing Great Ocean Road day trip by comfortable air-conditioned coach. 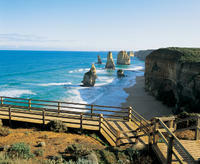 Your Great Ocean Road tour begins with panoramic views as you leave Melbourne and cross the West Gate Bridge. You’re soon on the coast, passing world-famous Bells Beach, host of the World Surfing Championships. Relax on the drive as the winding Great Ocean Road hugs the coast, running beside a string of surf beaches to reach the seaside holiday resort of Apollo Bay. After lunch (own expense), continue your journey along the legendary Great Ocean Road to the limestone rock formations known as the Twelve Apostles. Once joined to the coast, see how the rocks have been eroded over millions of years into the craggy pillars you see today. Go for a stroll along the cliff top or follow winding beach trails at this beautiful wild and windy spot. At Loch Ard Gorge, hear how this dramatic landscape has a tragic side, as you listen to the tale of the British ship Loch Ard that ran aground near Muttonbird Island in 1878. The two sole survivors came ashore at sheltered Loch Ard Gorge, where you can read the plaques describing why this stretch of shoreline is known as the Shipwreck Coast. Your last stop on the Great Ocean Road is the seaside village of Port Campbell, sheltered by the surrounding cliffs and Norfolk pines. Browse the boutiques and galleries, or stop for afternoon tea (own expense) at one of the town's many cafes. Relax on the return trip to Melbourne, returning to the city at around 7:30pm.